Haris and Panos Katsimichas, the twin brothers also known as Katsimihas Brothers, were born in Athens in 1952. 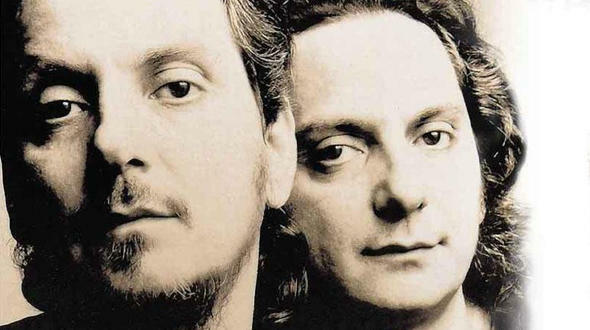 They are Greek songwriters/performers from the most important, evergreen Greek artists, who shaped the Greek Rock scene for the last 25 years at least. They studied and performed in Berlin for many years. They formed a music duet, and in the greatest part of their music career they worked as such. Their first album titled “Zesta Pota” was released in 1985 and was produced by the notable lyricist Manolis Rasoulis. Since then and for approximately 20 years now, they release albums together, where they write and perform their songs themselves. At the same time they appear live in music scenes of Athens, either alone as a duet, or in collaboration with other musicians. They also participate in records of other famous artists.